In Hollywood, word-of-mouth leads to most jobs, so it helps to have a memorable calling card. When cinematographer Meena Singh asked me to design hers, I chose materials that embody the strength, confidence, and movement in her work (The Confession Tapes, Little Stones, One Cambodian Family Please for My Pleasure, Hollidaysburg). 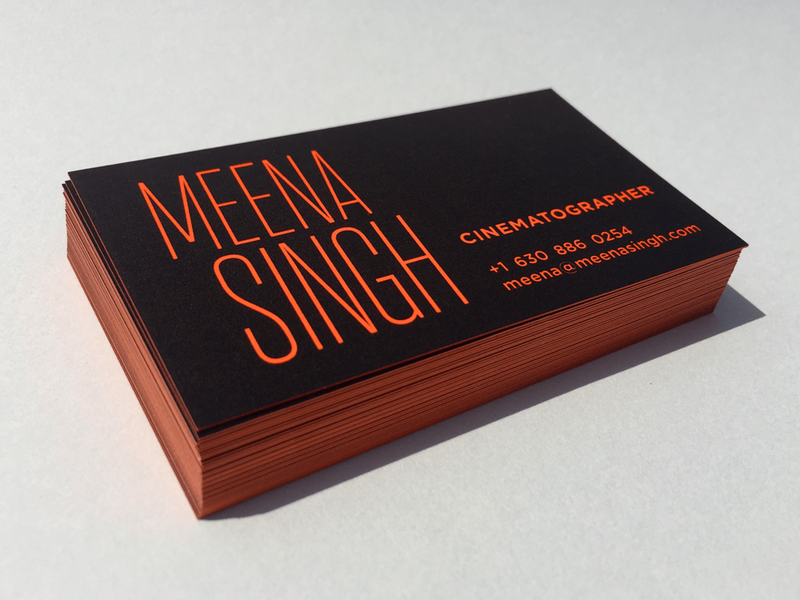 A thick orange stock gives her cards a vibrant edge. Strong and smooth, they’re a pleasure to hold. Through the gaps in a double hit of black ink, the tensile italics of Action Condensed resemble an orange neon sign, urging whoever holds this card to remember that name.